It's the quintessential symbol of Halloween: the Jack-O-Lantern. Fortunately, it's also one of the easiest designs for a baker to make. 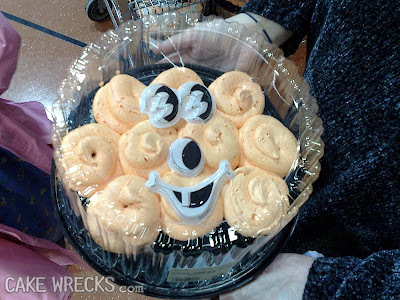 Just take one round cake, ice it in orange, add a cartoony face, and...voilá! Er. Heh, sorry. Let's try that again. A Pumpkin Poo-nicorn. Well. That's a first. What the...what IS that? Come on, seriously, there's no way you could make this thing look less like a pumpkin! Allow me to retract that last statement. Well? Orange you glad I didn't say "voila?" Dorota, Carra M., Melody N., Shanna T., Andrew M., Ted, Donny & Amanda, Kaitlin K., & T.A., don't ask me; I'm going with "abstract jack-o-lantern." Lol! I always enjoy your posts! It does seem like pumpkins ought to be pretty easy but after seeing these maybe not! Let me first thank you for knowing the word is "voila", not "wa-la" or "walla"! And what is that non-cake monstrosity? laughed so hard I snorted. loudly. at work. Were these decorators stoned? "A hur hur hur, I know what'll be funny! I'll make the worst pumpkin EVAR!" I mean... this has got to be one of the easiest designs to get right, if one makes any effort at all! well, that is impressive. good work, Jen! Yuck! 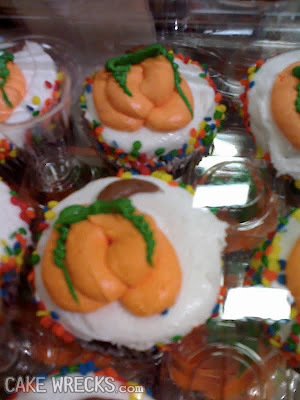 Those "pumpkin" cupcakes look like orange poo, I'm not eating those! The first one is pretty well made, just... ech. Have these bakers ever SEEN a real pumpkin? huh? huh? I think I'm in love with cake #7. No really. It's so awful that it's kinda great. Yeah, you deserve all the accolades and success. Keep 'em coming! I actually kind of like the first one. I mean, it's pretty well made, and well, jack-o-lanterns are SUPPOSED to be kinda scary, right? Wow, *snork* these are GREAT! Maybe it's just the mood I'm in today, but I kinda like #1! And #7 would be great if it hadn't cracked. My 2 year old who loves pumpkins said "whats that" to every picture. And when I told him it was a pumpkin he laughed!!! Ummmm....that last one is dirty, right? I think the last photo looks like halved apples. Yeah, that's it. I'm usually up for all the frosting I can get but I've never seen orange poo on cupcakes before. If there isn't a cartoon character called Pumpkin Poonicorn, there darn well should be! Pretty sure I thought the top cake was going to jump out of my computer screen and try to eat me! If the goal was to scare me, it worked. ahhhhhhhhh!!! Ha ha ha. Thanks for sharing!! The second to last one with the angry face with the crack through it? That one's pretty good, except for the angry face and the crack. Pumpkin poo-nicorn should be the Band Name of the Day. WV:gospine. 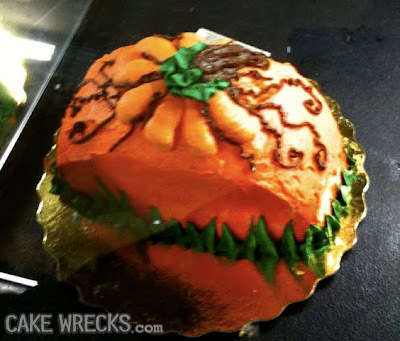 The other bakers in town were gospine about Loretta's inability to make a jack-o-lantern cake. from someone who lives next to Walla Walla, not Voila Voila. I always thought a jack-o-lantern was pretty much impossible to screw up. I should have remembered: Any time you think a concept is foolproof, some fool will prove you wrong. Wow! I was going to comment about the 3 noses on the 2nd cake, but they just kept getting worse and worse (love the title "pumpkin poo-nicorn," BTW!) until there's no comments anymore, just mouth open, head tilted to the side, saying; "Whhaaaa?" I'm skeered of that first one. HAHAHAHA She said POO-NICORN!!!! HAHAHAHA...... *Sigh*. (wipes eyes) thanks Jen I needed a good laugh. Umm, I'm going out on a limb here and saying that I LIKE the first one. And the second 'not-cake' (being a fan of rice krispie treats). Please don't eject me from the fan base. poonicorn - *snort* --ah, where does that hyphen go? I'm beginning to believe that wreckerators think we're all really stupid, expecting us to accept what they do. #1 AttACK of the Kiiiiillller TOmaTOEs! #2 A giant popcorn ball. Does it have 3 noses or 3 cheeks? #3 A peach-colored pumpkin? They can’t even get the color right. The plastic face is creepy. #5 They put the pumpkin in a vice. #7 Am I the only one to see something “odd” with the stem?? Orange you glad to see me? I am! #8 Orange and brown poo? Looks likes someone’s digestive tract doesn’t feel well. wv - demplabi: Demplabi the worst pumpkin cakes I've ever seen! The "voila" through gritted teeth just needs some babies on those carrots and it's good to go. The third one from the bottom looks like what Meatwad would look like dressed as a pumpkin for Halloween. I thought it was actually kind of cute! The rest were hideous! 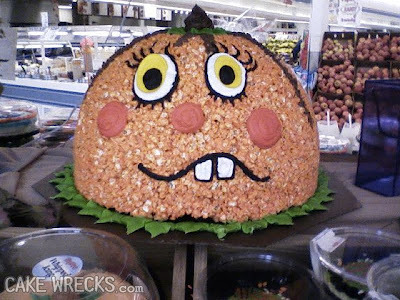 Pumpkin poo-incorn is probably one of the funniest things I've ever read in my LIFE! WV: unwqe - To be seen on a future wreck instead of the correct spelling of unique. You owe me one keyboard to replace the one that I ruined when I snorted Coke Zero at the pumpkin poo-nicorn! I can't even type that without laughing! From now on, no more drinks until I am done with this site. these "cakes" are truly shudder worthy. hard on the eyes. for sure. I can't believe anyone actually pays money for them. I agree---I don't think these decorators have actually seen a real pumpkin, even though they had to trip over them getting into the store this time of year. Every time I think you HAVE to have run out of bad cakes - after all, how many REALLY, REALLY bad bakers/icers can possibly be out there? - you post another collection of not-to-be-believed cakes (?). I would be so darned embarrassed... Even on my worst day, when the only decor available was either (a) sprinkles or (b) gel icing in a tube, NEVER were my cakes this bad. Even if I THOUGHT they were... Thanks for my daily laugh!!! This is now one of my top five favorite posts. the pic 3rd from last looks like meatwad from Aqua Teen Hunger Force! In the spirit of Holloween "WTF is that? Aaagh!" then Cake #1 is a win. So are the poo-cupcakes because I'm shudding what you'd have to eat to get orange out the other end. WV: Ingorne. Igor's busy right now harvesting fingers for cupcakes, this is his part-time assistant. WV - strumed: the wreckerators strumed und dranged, but still couldn't come up with something that looked like a pumpkin. Mein Gott! Every time I see "Voila," I am reminded of someone of Facebook who wrote something like "Wahlah! Here are the pictures!" Took me a sec to wonder WTH they were trying to say. Then it clicked. 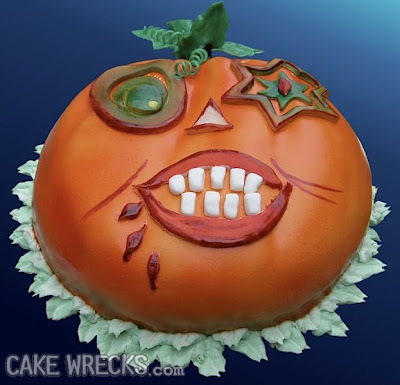 That first cake looks like what would happen if the YouTube character Annoying Orange got gussied up for Halloween. Scary! #1 looks likeit was enjoying being in a barroom brawl, blood at the lip, black eyes, etc. #2 --is it made of caramel corn? it looks like something out of Spongebob Squarepants. #5 looks like something that only comes out at night and creeps around in nightmares and horror fillms. #6 Oscar the Grouch's lonely orange cousin? wearing a muzzle? and a dorky hat? maybe it's a bullying victim pelted by vegetables? #8 anemic peppers--very pale!or are they knockwurst? or organs? #9 What are those tiny green birds doing flying with those time travel thingies from Harry Potter? HAHAHAHAHAHA!!! Pumpkin Poo-nicorn! It doesn't get any better than that! Actually I really liked the first two cakes. Sure, they don't look like pumpkins at all, but they do look Halloween-ish and they're rather cute. 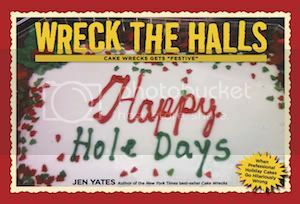 The other cakes were indeed complete wreckies. Oh. My. Those last two make me feel dirty. hahaha! The next to last one has "poopkins" on it! I was waiting for you to say that!! "Pumpkin Poo-nicorn" made me laugh waaaay too hard. Thank you! Thank you for all the laughs. My hubby and I love it! That last cake looks more like orange vulvas were drawn on.... perhaps its their Snookie-o-Lantern cake? so i'm not the only one who thought that last cake looks like it might have been a rendition of a series of ladies in the stirrups. good to know it's not just me. wv: rerche - some of those cakes are so bad i had to go rerche. pass the disinfecting wipes. OH MY! That was a good one today!! thank you for the laugh!! I snorted too, just not at work!!! You keep using that word "voila." I do not think it means what you think it means. I shall take the idea of a ballad for the poo-nicorn...and run with it!! Silly,whimsical (but also serious! :) couplets will be here within the next few days!!! *resurrects* CCCs gussied up as mutant gourds of dubious ancestry? PTOOOIE!! @Mary, ummmm that last one is a little....shall we say....feminine. Ah-hem. Moving on, yes, please ;) . Have to say I kinda like the frowny one towards the end. But the others... sheesh! Now I know why there is a reason I hated carving Jack-o-lanterns. I could have had a less dangerous time just slapping icing on a cake--any cake. Several years ago I had a call at the library reference desk asking how to spell fu-ella. Stumped, I asked if she could put it in a sentence. "Sure. The caterpillar made a cocoon and fu-ella--it's a butterfly." Ah, yes! Voila! I can spell it for you. Oh my goodness! I love this blog, but have never commented before, but I had to seeing as how my 18-month old daughter started pointing to her bottom and saying, "bootie! bootie!" when I got to the last picture. Hilarious! See, they could be...distant cousins twice removed? Oh gosh! Pumpkin Poo-Nicorn! I LOL'ed at that one! I just can't imagine what they are thinking when decorating these things?!? 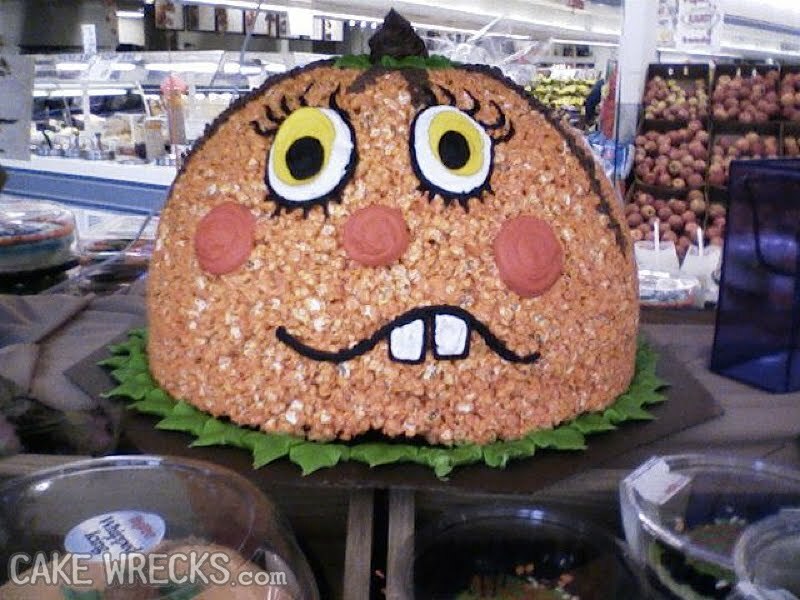 I think you have a new mascot: the Pumpkin Poo-nicorn! It can duel with Carrot Jockey for supremacy. I kind of like #7, the "angry face" pumpkin. If my cake cracked like that, I'd have that expression on my face, too. Did anyone else have the pear tree unveiling flashback from the last cake here? I HAVE to figure out a way to use poo-nicorn in everyday conversation. Just too funny! Thanks! Those last ones look like prostates. I laughed 'till I cried while reading the post, then I laughed 'till I cried all over again as I read the comments. Poo-Nicorn! I almost peed my pants reading the caption! Poo-nicorn? omg that is perhaps one of the funniest things I have read on-line. ever. Dear lord, have any of those people ever seen a pumpkin? I agree that the first one looks like it was well done, except for, you know, missing the mark and creeping me out. But it would have been nice. The last one is just disturbing. I'm sure THAT wrecorator was stoned. Or should be. With ccc 'stones'. hahahaha! this may be one of my favorites yet! and not that this is the worst offense, but what's with the pumpkin with three noses across its face? or was it three rosy cheek blushes? 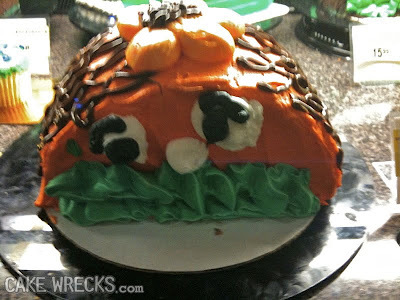 oh dear...poor pumpkin-creature. I would totally buy the one with the crack in it...if it didn't have a crack in it. Otherwise, it's freakin' adorable! Okay, the poonicorn alone makes this my all time favorite post, but the comments are also cracking me up. Would love to yell Abracadabra and turn the wreckerators into these horrific "pumpkin" things. But then all of us would have to run and hide from the evil unleashed lol. Man Halloween really gets me.. weirder than usual. What is #2 made of anyway? (yeah, I know, #2 - ha ha!) I'm guessing corned beef hash. WV: lopowine. No snarky comment, just funny. 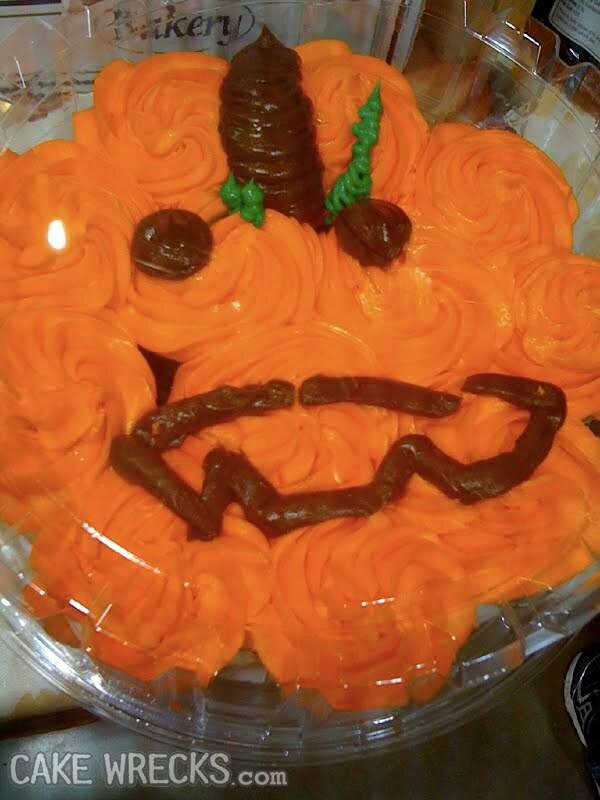 I didn't realize ATHF's Meatwad was a pumpkin cake. number 1 looks like Paul Stanley (In full Kiss make-up) after he had a bad reaction to some shell fish. 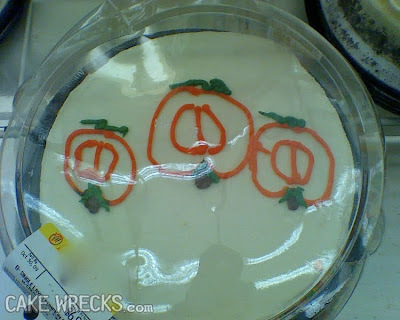 The last "cake" looked like it was decorated with "female parts" seen in abstract. and the poo-nicorn cake is just twisted. I do like the pissed off pumpkin cake. looks like he is DARING you to eat him. That last one is just.... whaaaaaat? First off, I think the first cake is cute. Secondly, LOLed at the "pumpkin poo-nicorn." And lastly, maybe that one pumpkin is scowling because of the crack in the icing? This is the best post ever! Thank you! I kinda like Mr. Grumpy. He looks fun. Popcorn?? *whew! * I though it was a dome of ham salad with slices of hard-boiled eggs for eyes. I'm pretty sure we used those line diagrams on that last cake to label gynecological parts on my Anatomy final exam a couple of years ago! Love that second one - I so want one!!!!! 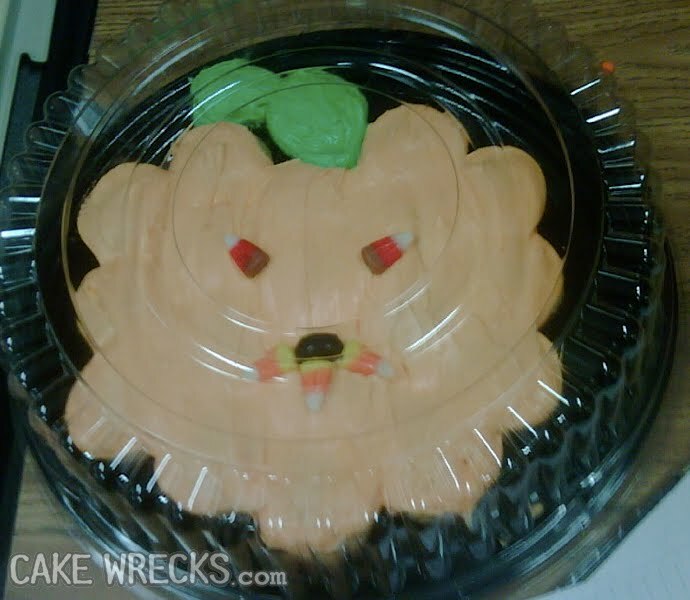 I actually think that first pumpkin cake is...kinda awesome. Am I the only one to see the Nazi "SS Lightning" in the plastic eye-pick things on #3? Honestly, it's unnerving me a little! WV: losins: Those bakers are losins their minds if they thought any of these would pass muster! well, sorry for the disagreement, but I don't see why the pumpkin pie third from the bottom is a wreck? I think it's quite well done and pretty cute. Especially given the expression on a PUMPKIN pie...wouldn't you too be frustrated with the tortuous grinding and scalding - er, I mean blending and baking in an oven - if you were a pumpkin being turned into a pie? How very undignified an end to its happy days growing in a pumpkin field...sure tastes good though! 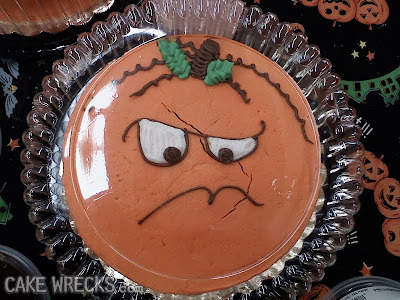 #7 is "The grumpiest orange in all the land"
If you don't get the joke, there is a Halloween song called "The meanest pumpkin in all the land"
I'm a new reader to this blog, and I have to say that I NEVER stop laughing. Not only are the cakes, CCC, cookies, pies, etc. hysterical, but the comments are spot on! Poo-nicorns. OMG! *headdesk* How can people be so....so.....so....I don't know. Someone help me. When I am reading this site, my hubby wants to know what I'm smoking! Keep up the good work! wv-dectrani--We need some dectrani to learn how to do our jobs! i thought the first pumpkin wasnt so bad :) just...... weird looking. Okay, I'll say the first one isn't bad. it's actually kinda scary. As a decorator for a major grocery chain, I sadly recognize many of these cakes. They're very poor renditions of the pictures the company sends us. This is (almost) what they're supposed to look like. When I get these pictures, I just throw them out. The last pumpkins were supposed to look modern and "stenciled". Bleh! Now that was funny! Good commentary. I think the first one was actually kind of good, the rest, LOL! The 3rd from bottom looks like an angry meatwad from ATHF. That last cake, made me think, "Um, peaches?" the third from the bottom one? that's totally meatwad from the cartoon aquateen hunger force! seriously...look at it! it's meaty!